Here we see three Perfekts and two Gabrieles from my collection. 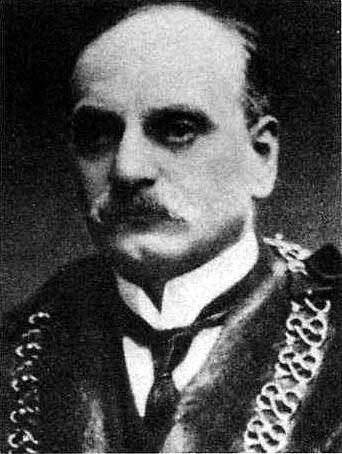 The story of Triumph typewriters begins with Siegfried Bettmann (below, seen in his mayoral robes as mayor of Coventry City), a man who had a knack of surrounding himself with top-line designers, whether it be for his typewriters or his motorcycles and bicycles. Bettmann was born in Nuremberg on April 18, 1863. He developed language skills and, at the age of 20, in 1883, settled in England. Even in his earliest days in London, first staying at the Station Hotel, Holborn Viaduct, and then in lodgings on Church Road, Islington, he managed to meet people who would help in his future enterprises. The first of these was Mauritz Johann Schulte, from Hanover, who was later to become Bettmann’s business partner. In 1884 Bettmann started work with Kelly and Company, using his ability to translate to compile foreign directories for its publications. But after six months he switched to the White Sewing Machine Company. In 1885, White’s business started to go downhill and Bettmann lost his job. He started his own business, setting up an agency to sell in Britain the German Biesolt and Locke sewing machine and to export British bicycles overseas. 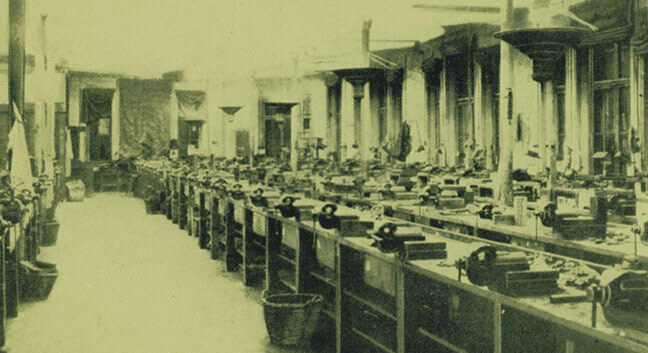 In November 1886 Schulte joined Bettmann as a partner with a £250 investment, doubling the firm’s initial capital. 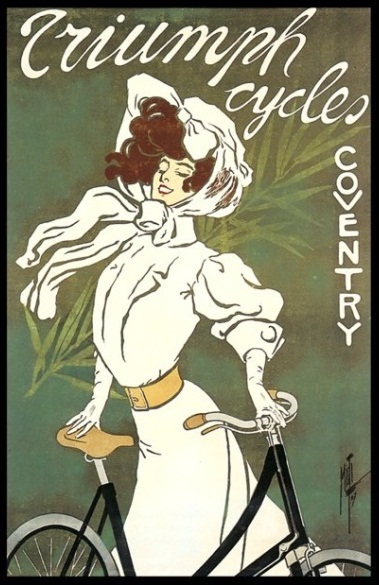 In 1887 Schulte came to an arrangement with the small Birmingham bicycle manufacturer of William Andrews. Bettmann, meanwhile, had settled in Coventry, and was exporting Andrews bicycles from there, labelled under his own name. He then changed the name of the company from S.Bettmann and Company to the Triumph Cycle Company Limited. Ten years later, in 1896, with his British business booming, Bettmann returned to his home city of Nuremberg to set up a German branch, Deutsche Triumph Fahrradwerke Aktiengesellschaft. 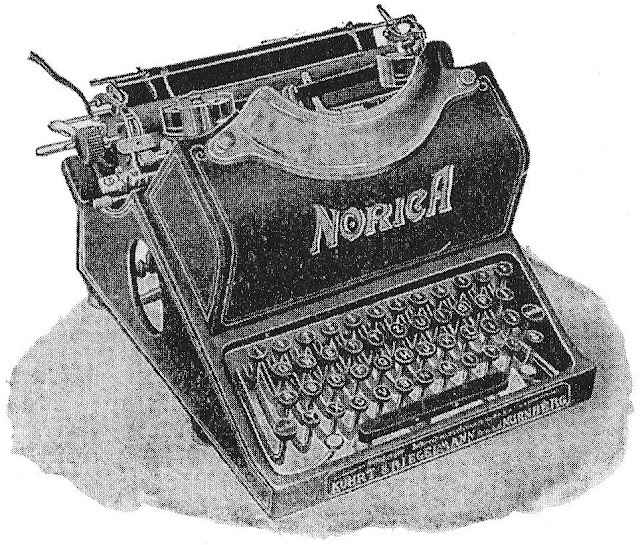 In 1907 Karl Friedrich Kührt had started a typewriter company, Kührt and Riegelman GmbH, in Nuremberg, making a machine he had designed and called the Norica. After two years, however, the business went bust and Bettmann was able to take it over. The Kührt family, by the way, were unthwarted by the collapse of the Norica venture. In 1909, Kührt launched Schreibmascninengesellschaft Franconia, in Nuremberg, taken over by Otto Baldamus in 1912, Later Hammerwerk Mayer and Company produced the Omega and the Excelsior, the company becoming Schreibmaschinenfabrik Augsburg AG from 1921-26 and Excelsior-Maschinen GmbH, Berlin. Two of Kührt’s brothers, Richard and Arno, also became involved in the business, first with Deutsche Schreibmaschinenwerke as Hovelmann, Kührt and Bollendorf (1909-1913) then Nierhaus, Kührt and Bollendorf (1913-1919.) From 1919-23 this company became Minerva Schreibmaschinenfabrik Achille and Richard Kührt, until briefly taken over by Ludwig Dreyer. Dreyer produced the Helma in 1927-1928. 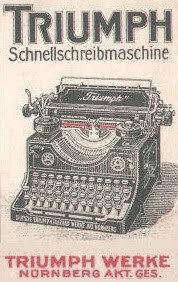 In 1914, Karl Kührt made a machine with an interchangeable typebasket, the Commercial (aka the Markana, Framo-Record), through Commercial Schreibmaschinenfabrik K.Fr. [Karl Friedrich] Kührt. In 1921 Arno Kührt, developed the Reliable (aka Liga) through the Reliable Schreibmaschinen GmbH, and an off-shoot, the Phoenix, from Hegeling-Werke, Eitorf. 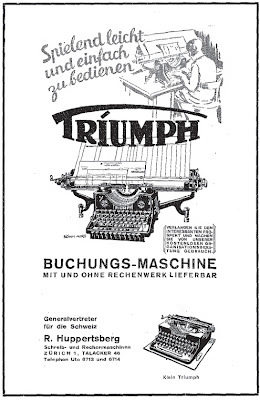 Siegfried Bettmann continued to make the Norica, but was fortunate enough to acquire the services of one of Germany’s greatest typewriter designers, Paul Grützmann, who designed for Bettmann a new machine, called the Triumph. 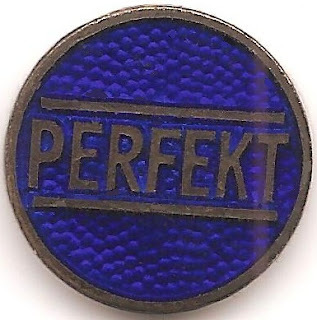 In 1911 Bettmann changed the name of the company again, this time to Triumph Werke Nürnberg AG, and started exporting to Russia, Italy and Argentina. After World War I, Triumph continued to prosper. 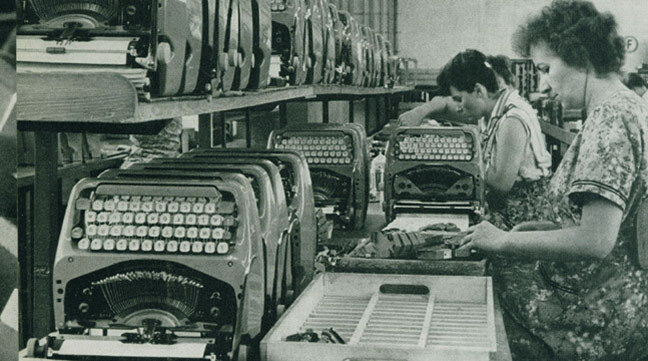 By 1921 it was making 3000 typewriters a year and in 1925 it won a contract with the German Postal Service for 600 typewriters for the sevice's telegraph division. 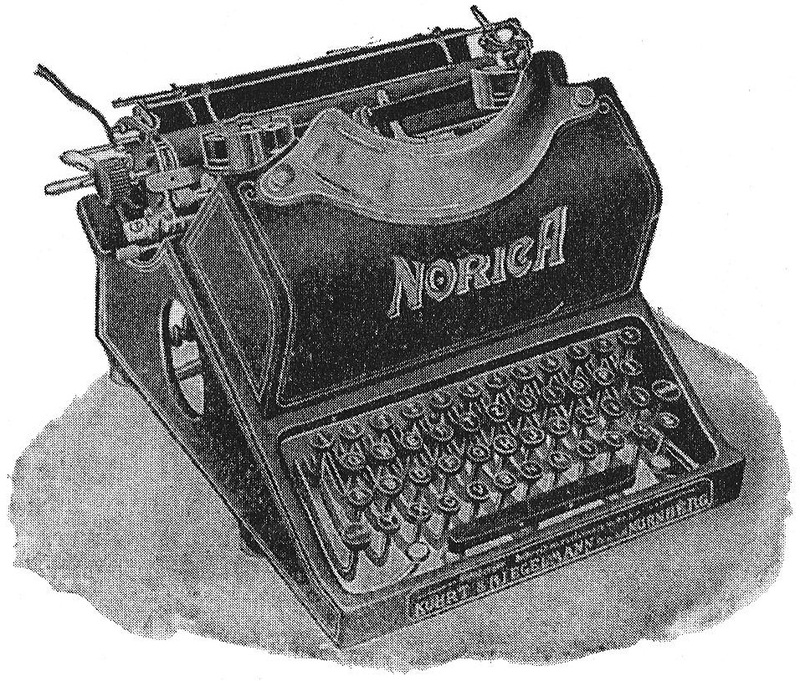 Oskar Gšrwitz, chief executive of the general agency with negotiated the deal, Horn & Gšrwitz, in Berlin, adapted a Triumph typewriter as a telegraph machine. Triumph’s Model 10 won favour far and wide, including from Pope Pius XI, In 1928 Cardinal Menotti telegrammed from the Vatican. 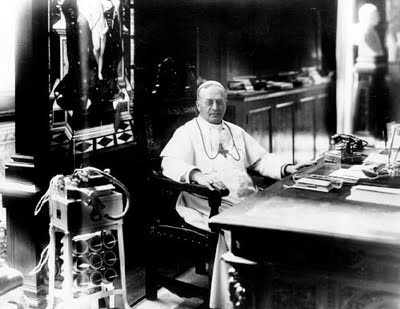 “Am delighted to report Holy Father expressed greatest pleasure with Triumph typewriter and gives his blessing for well-being of management and workers of Triumph.” With or without the Pope's blessing, in 1929 Triumph became the first office machine company in Germany to introduce serial mass production techniques. 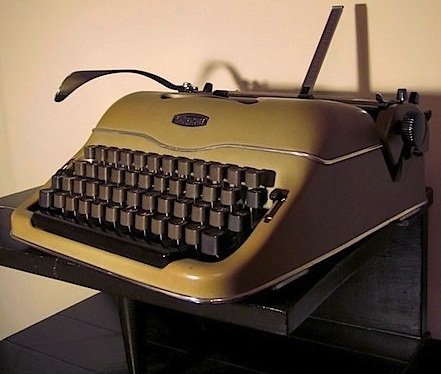 That same year, it introduced its first portable typewriter, the Klein Triumph, later the Durabel, with its development and sales and marketing coordinated with Adler. 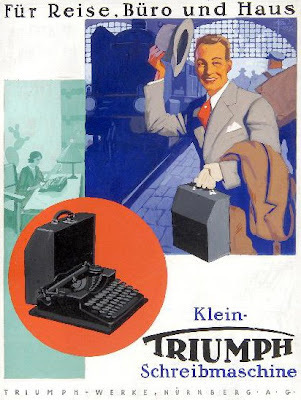 Triumph’s head design engineer at the time it produced its first portable was Carl Kupfer. 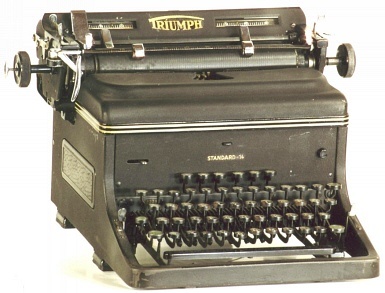 Like the portable, Triumph’s Model 12 (above) was also sold as an Adler. This machine introduced a segment shift. With Berthold Baumann designing for it, Triumph was at the peak of its powers when World War II broke out. It had a workforce of 1800 and annual trade worth 15 million marks. During the war, forced labourers are assigned to Triumph and ordered to make armaments. Typewriter production was suspended in 1942 and the next year the factory was severely damaged by Allied bombers. The plant survived, however, and in the final days of the war, workers refused Nazi orders to destroy all the machinery and equipment before American troops arrived on April 20, 1945. Production slowly resumed the next month, including typewriters. 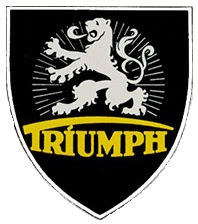 With Friedrich Wunderlich, whose design work for Triumph spanned the war years, and Rudolf Neidhardt working for it, Triumph quickly regained lost ground in the reconstruction period after the war. Triumph brought out its Matura office typewriter and in 1956 an electric Matura. 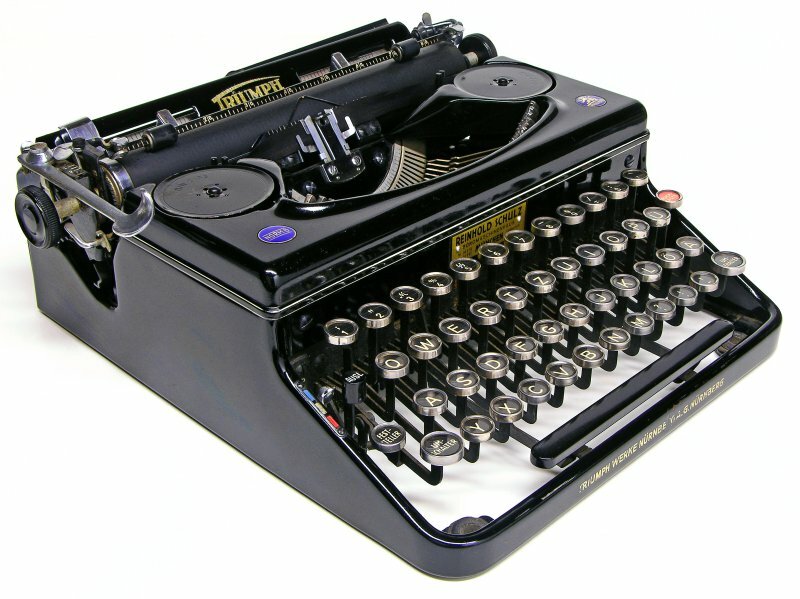 By the end of that year, the one million sales mark was reached for office machines and portable typewriters over a 47-year period since 1909, with half that number sold after 1945. 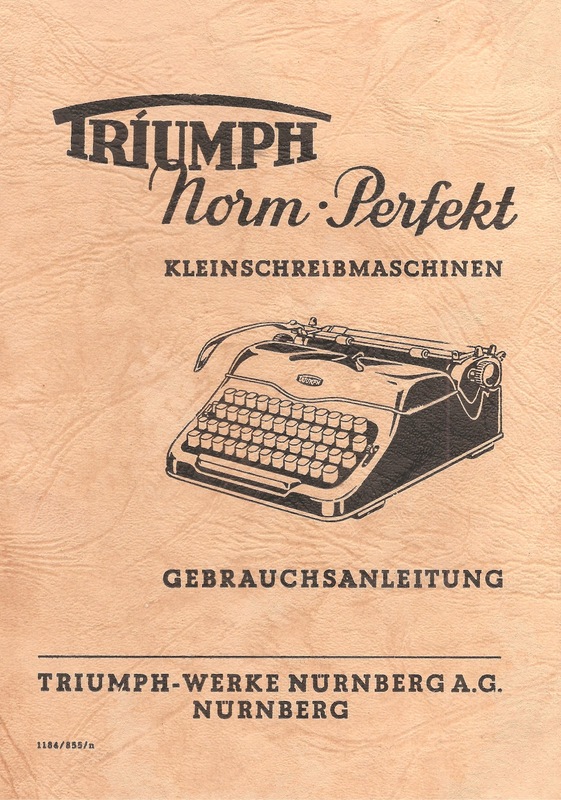 The Norm and Perfekt portable typewriters had been introduced along with the Durabel in 1935, but after the war, the stylish remodelling of the Norm and the Perfekt ensured that Triumph maintained its very high reputation for design and for producing the highest quality machines. 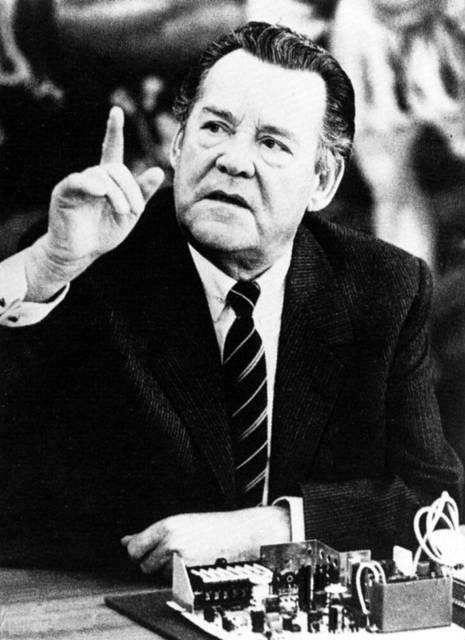 At the end of 1957, Fürth-based radio and television set manufacturer Max Grundig (above) purchased Triumph share capital and used the company to buy a cross-shareholding in Adler’s Frankfurt plants. 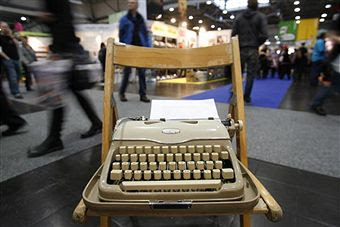 A new generation of family typewriters was named after Grundig’s granddaughter, Gabriele. 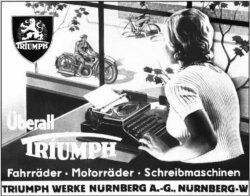 The Grundig Electronic-Triumph-Adler (GTA) joint sales organisation marked the practical start of the merger between Triumph and Adler. 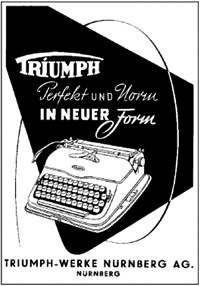 Development, production and administration were still separate entities, although Triumph and Adler worked in close collaboration. 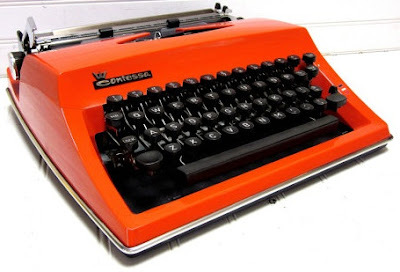 One prime example of this association is this 1969 design by Gerhard Dietrich and Peterheinz Meyes of Fürth for Triumph, but for a Contessa-Gabriele portable typewriter which became much more widely recognised as an Adler. The production programs were combined. In 1968 Triumph and Adler were fully integrated, becoming the fourth-largest office machine manufacturer in the world, behind the market leaders Olivetti-Underwood, Litton and Olympia. 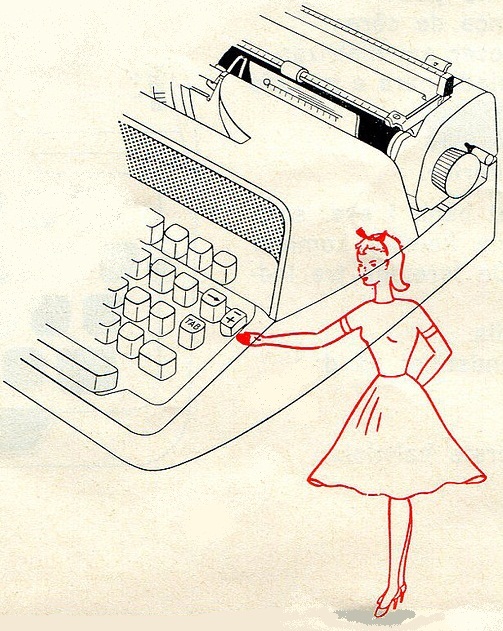 The next year the Gabriele 5000 portable electric typewriter was launched. 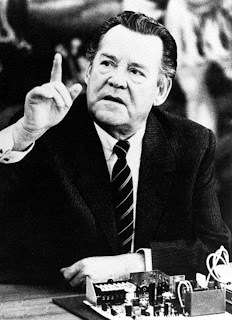 In 1969, Grundig’s move toward colour television led to him selling Triumph-Adler to the Litton Group, which had already taken over the Royal and Imperial typewriter companies. 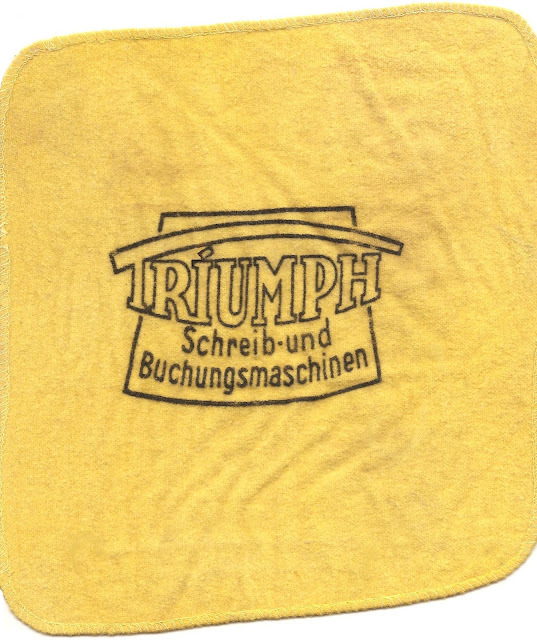 In 1977, in an attempt to expand its manufacturing capacity and sales in the US, Triumph-Adler engulfed Royal. 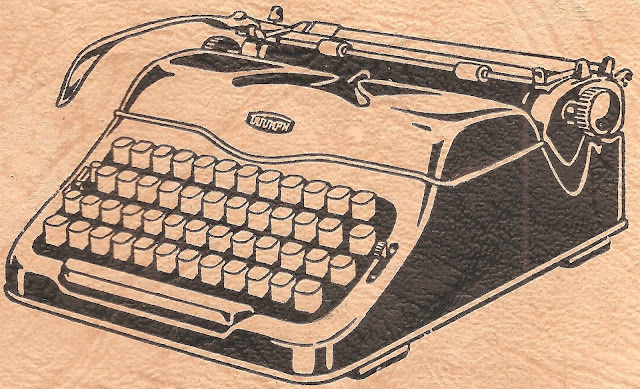 It was a move that had similarities with Olivetti’s takeover of Underwood in 1959, an investment which almost financially ruined Olivetti. 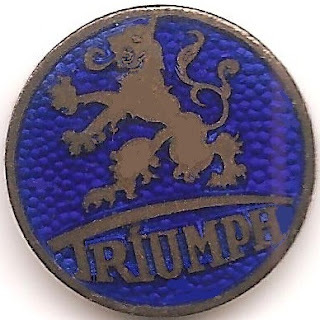 The same thing happened to Triumph-Adler, except in this case Triumph-Adler did lose its identity, Within two years, sales losses had pushed Triumph-Adler into the red, and it was taken over by Volkswagen AG. Once again Robert, you have created a wonderful and informative post! 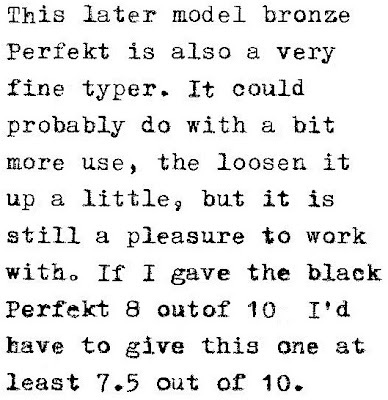 I really like the black Perfekt. It looks brand new. I have an Adler J4 (Gabriele 32? I saw one on Austrailian Ebay a few weeks ago that looked like the J4) and it is a really nice machine. 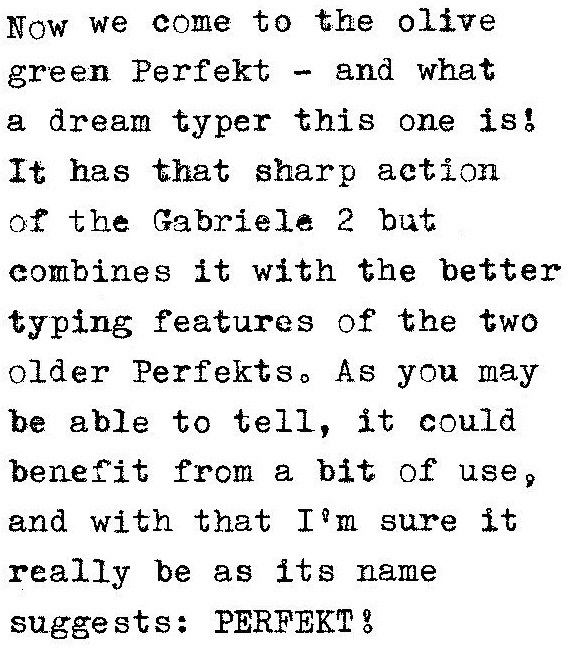 The Gabriele 35 (Adler J5 I guess, here in the States) is on my want list. I find these machines almost as nice as my TP1 except the carriage on the Adler is much more frictionless when it slides than my TP1. Have you noticed that? Fun post! I have yet to even see a Triumph here. Those round-bodied ones sure resemble my Adler Universal though. Very good post, and very timely! I just found a nice Triumph Gabrielle 2 from 1962 with German QWERTZ keyboard. I bought it from the original owner and should be arriving here tomorrow afternoon; now I have an excellent source of information regarding these fine European machines. Thank you! 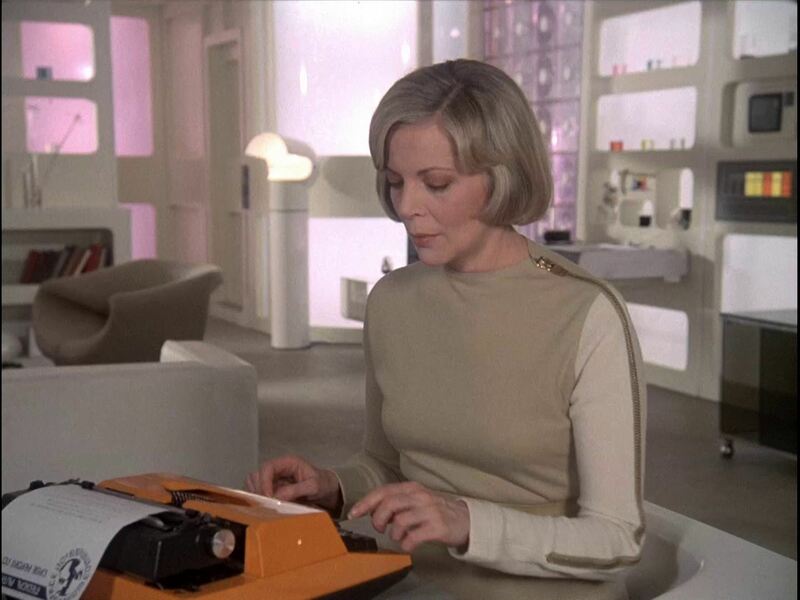 Heh, is that shot of Barbara Bain typing on an Adler a screenshot from the show "Space: 1999"? Strange symmetry: Triumph's Coventry factory was bombed to obliteration (along with much of the city's other buildings) in 1941. Man. I gotta get me one of those. Incredible. You continue to amaze me with your Encyclical Typo-pedia! And, yes, that is Barbara Bain from "Space 1999" with a type writer! Notice that the Enterprise on "Star Trek" was completely paperless! Thanks very much for these pages. 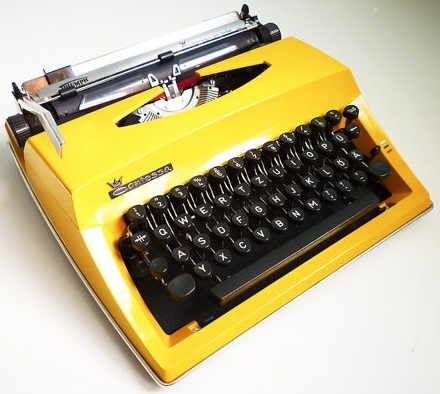 I have a pristine white Gabrielle 2000 electric 'portable' made in 1978 (it weighs more than I do) which produces elegant and fine print. I do like the TA machines, they have a classy 'something' about them. 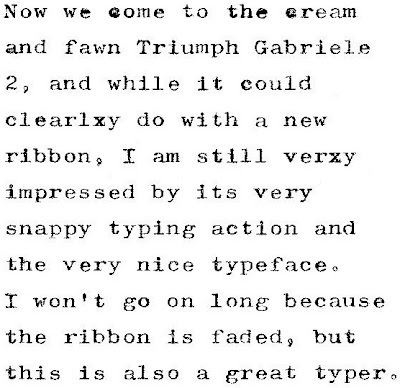 I have had Triumph Gabriel E for a while now. 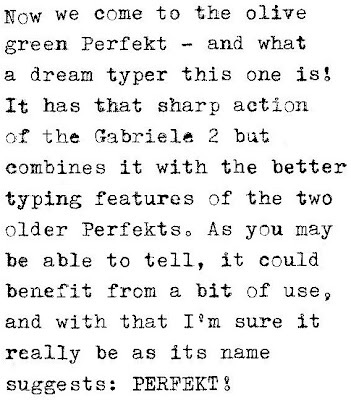 I just recently started looking up info on it and i keep stumbling into Gabriele 2, instead of the E im looking for. Any info on that? It could be that it was just a less popular model at the time. It does look exactly identical with your Gabriele 2. Hi. I can't help much with this, I can't recall ever coming across a Triumph Gabriel E. I can only assume it was used to differentiate from the Adler? You will have noted post-Grundig, Adlers and Triumphs were identical, and the Gabriele comes from the Grundig family. That would have been my second guess too. 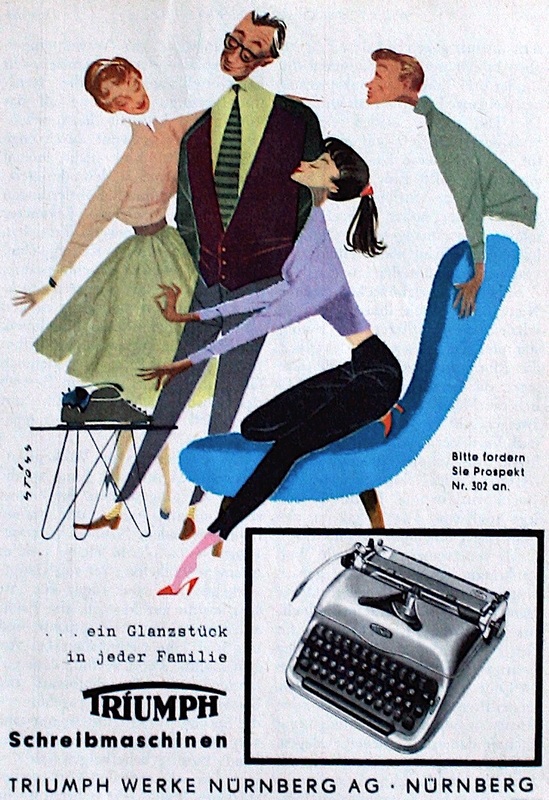 I only learned about the Grundig/Adler/Triumph merger after doing a bit of research online. 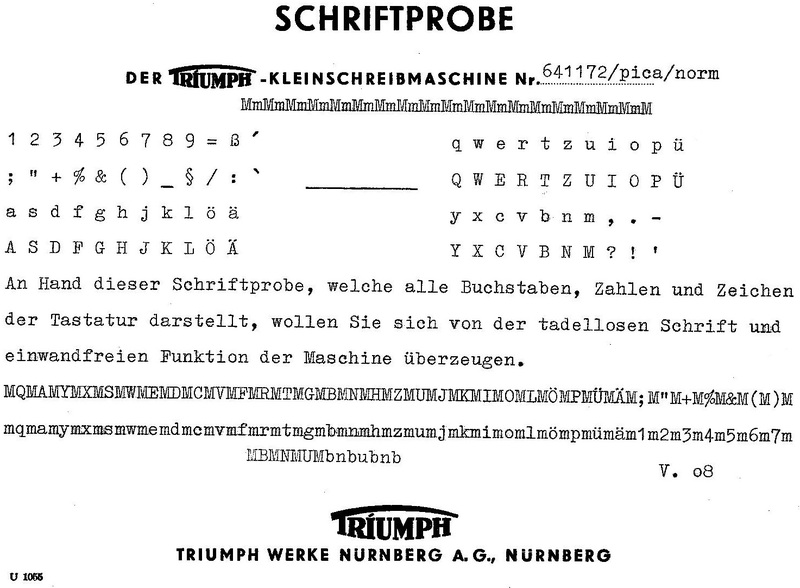 The confusing thing is that there is no indication of that in the ''paperwork'', like i have seen in some other Adler/Triumph manuals. 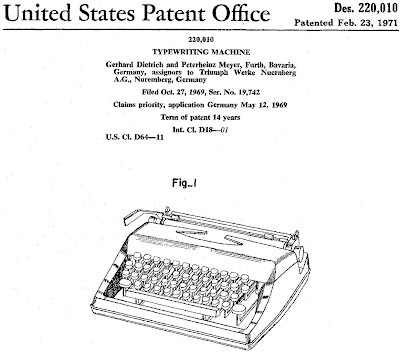 Oh well, kinda neat anyway that i'm not able to easily find exactly the same typewriter. Just back from a month in the deserts of Southern California, and met by six cartons all containing typewriters as a result of my continuing collection obsession. Three gems out of the lot, one "interesting", another a likely long-term repair project, and the sixth a pile of broken plastic as a result of poor packaging. But among the gems was a Triumph "Norm", SN 436932 which the database puts as manufactured in 1943. It is a lovely maroon machine in perfect condition, similar to the photo of Alan Seaver's in your wonderful post. But the keyboard is English, not German. Which begs the question, was the company still exporting during the war? BTW, the two "buttons" shine up well with the application of light auto polish. I have a Triumph Gabriele 10. Any idea what its value might be? 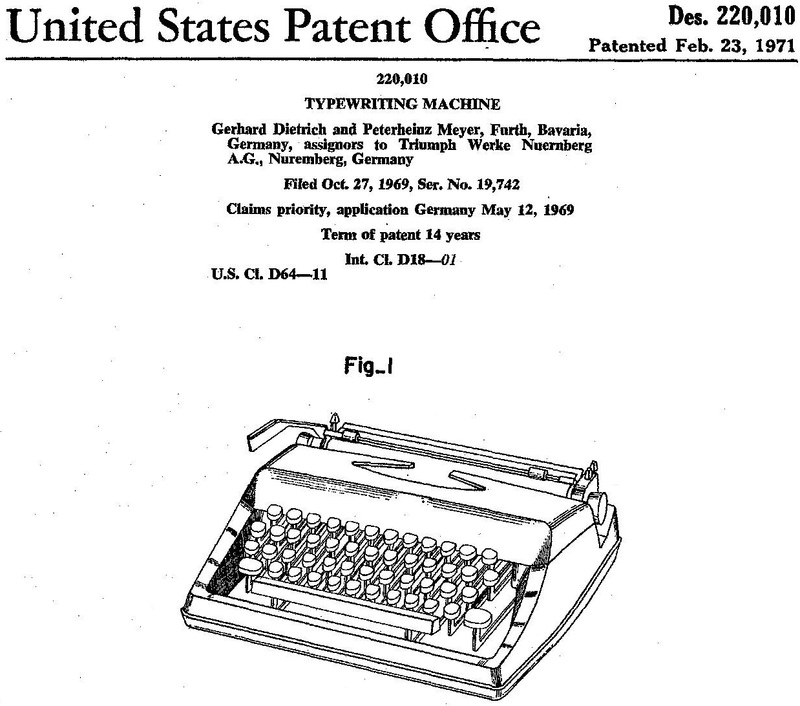 I'm pretty sure your typewriter will take a Universal ribbon, which are readily available. If not, simply wind the ribbon from the Universal spools on to your existing spools? Great informative post. 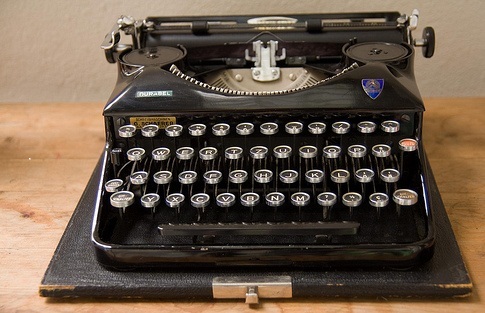 I just purchased an Adler J5 (Gabriele 35?) at a local antique dealer. Nice to know some of the history. I don't know where to find the SN to check the database, but glad to know when these were designed, etc. Thanks! Hi i have triumph model from late 20`s and i am very interested in selling it. Is it possible to help to find some who would be interested in buying this machine. Im from Serbia and its really hard to find somebody who will buy it. Hi Robert, thanks for all your info. 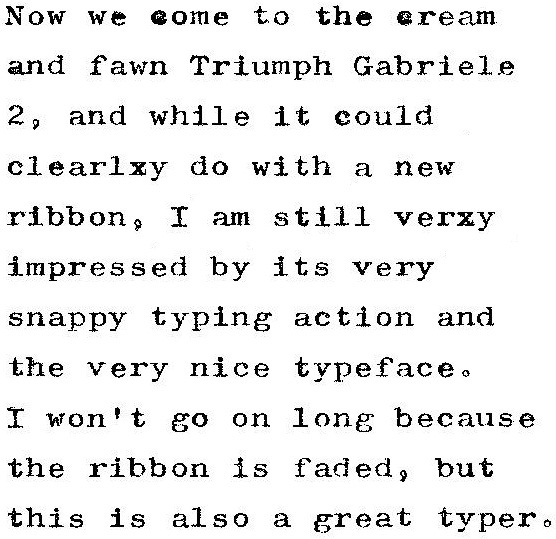 I have a Triumph Gabriele It does not have a number after it and looks very similar to the #2 I'm assuming it was the first. It has a tag on the back that says Hiller Burohaus Koblenz. 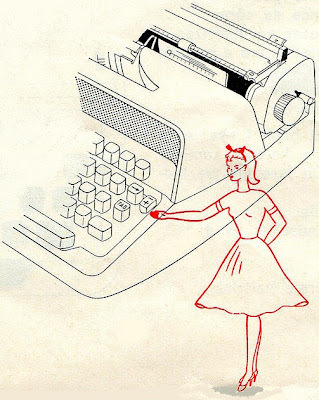 I am having trouble finding out the value of the typewriter. Would you happen to know? Madde in Holland. On the top right hand side it says JUMBO easytyper, Made in the Netherlands. Under the keys there is a number, 10739828. Can anyone help me identify it? It is one of the portable ones as is built in its own case. Please help. Thanks in advance. 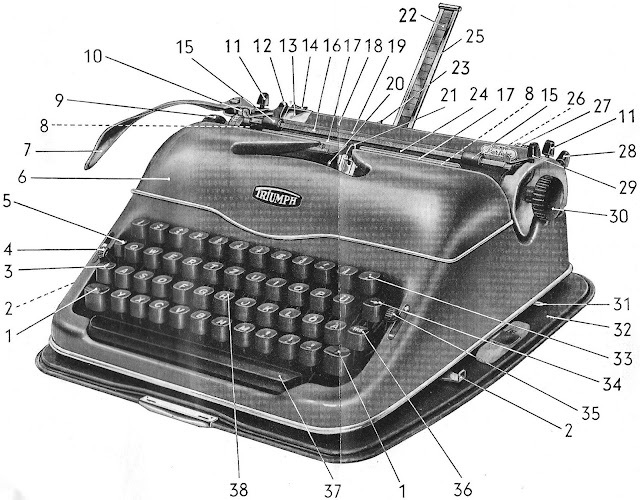 It will help in finding a ribbon if you call it a typewriter, not a typewrighter. T-A stands for Triumph-Adler, probably (as the machine was made in Holland) when owned by Litton Industries. 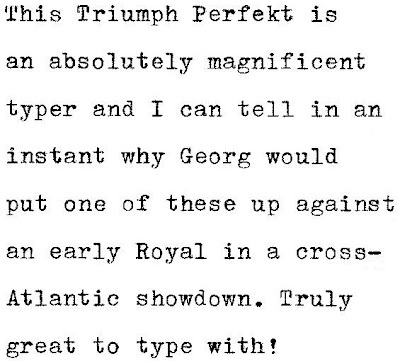 But Jumbo Easytyper suggests it is an Apple product! I have a Triumph perfect type writer and we want to use it next month for a wedding. We are in urgent need to find a new ribbon. We live in Vancouver, Canada. 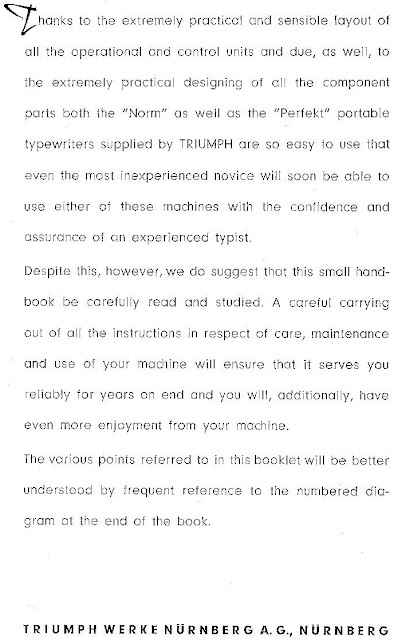 Thanks for a wonderful, in-depth look at the history of Triumph writing machines. I just wanted to send one small correction. I hope it doesn't come across as too nit-picky, but when you make reference to the Triumph Standard 12, the photo is actually of a Standard 14 (zoom in and you'll see the badge as well). The 12 is the earlier machine, mechanically identical, but with the more sculpted, open body style. Lovely machines, if heavy as boat anchors. Greetings from the far side of the North American continent (Ohio, USA precisely). The great thing about the Internet is that old work never dies - this article keeps on paying dividends! I found it to be very informative. It has aesthetics like a Royal P - but the silver and enamel Triumph shield on the front, with the yellow cellulose "window" on the back of the machine, make it really stand out in a crowd of black typers. Where does the Model 1 fit in with the lineage of the Durabel? Hi Brian. Thank you for your kind words. Martin and Dingwerth both date the first Triumph portable (your model) to 1928. 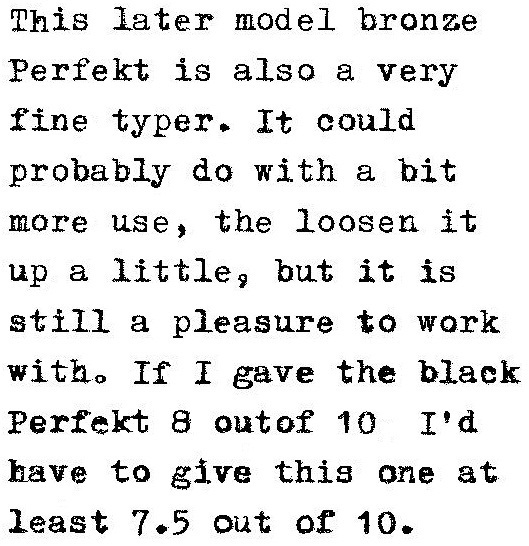 Martin adds that it is essentially the same typewriter as the Adler Model 32 (see elsewhere on this blog). 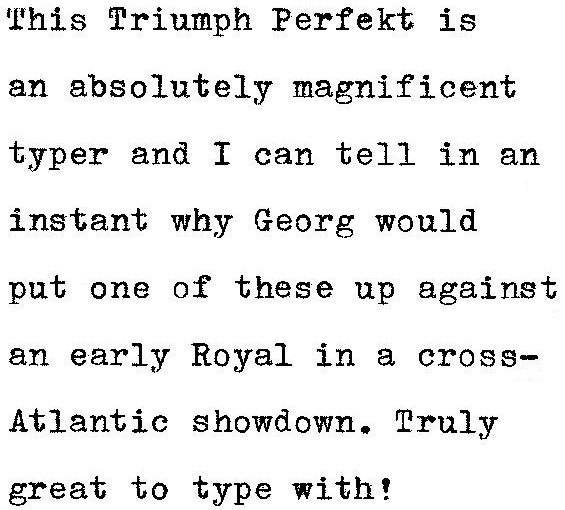 You will note from this post the cooperation between Adler and Triumph at this time. 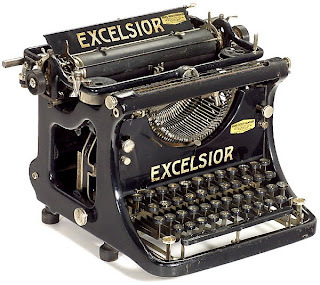 The Adler Models 31, 32 and 32S, however, came out in the early 30s, a break from Adler's thrust-action portables. 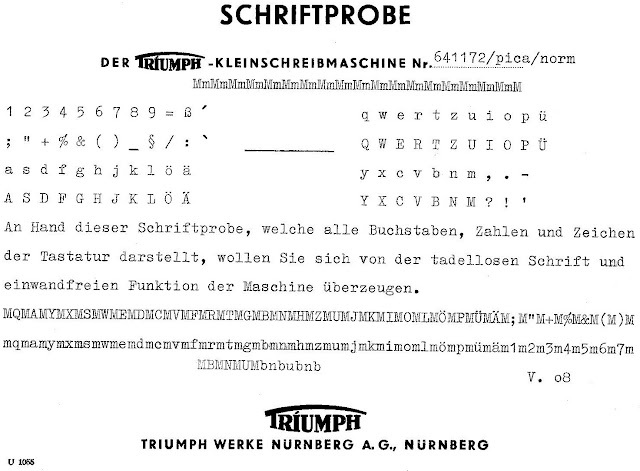 Another clone is the early Swedish Scriva - the Scriva in the database is the 1949 Triumph (Durabel). Given all this it is more likely to originally be a Triumph design, probably from Carl Kupfer. Hi this is Markus from Vienna! Greeting from the other side of the globe! You put up a great blog! The only thing that I would like to do is to replace the ribbon as the writing is rather faint. However, I can't find the right manual for the Standard 12. Do you have a suggestion where I can find such a manual. In general, I would love to read up on all the functions of the different switches, sliders, knobs and what not. As you have a decent collection of typewriters - do you have any idea where I can find the serial number of a Triumph Standard 12? Hello thanks for your informative history! Have a portable Triumph which does not match any pictures or lists I've seen. It has the model # WLT32K on the top left. 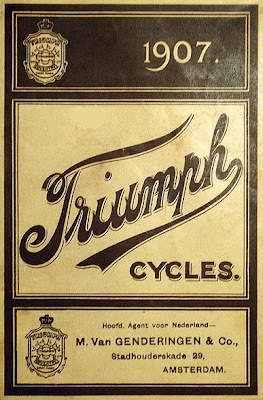 Triumph logo top right. Any help greatly appreciated! Thank you much for this article. It really helped me. 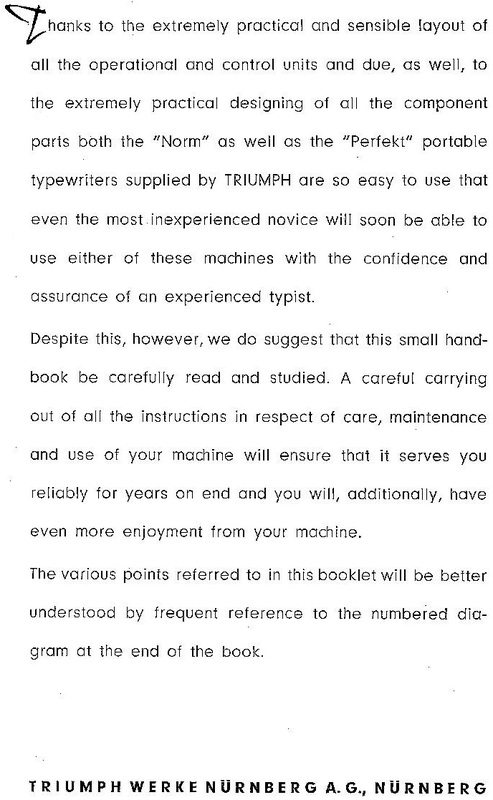 I am doing graduation exam and and topic of my graduation work is the Triumph typewritter.